Snoop Doggy Dogg was once a pilot in a film called ‘Soul Plane’ in an American film some time ago. But this time round, it is of course the time for some Ghanaian actors and actresses to put on some of their actions right into the skies for all to watch, see, look or enjoy in the various cinemas. Yes you are not dreaming, neither are you gesticulating in your mind nor brains with some empty imaginations. This is a Ghanaian movie by a Ghanaian story teller whose narrative is simple and sarcastic. This is what one gets when Liwin, Kaly Bos and Kwaku Manu, are ‘thrown into the air’ as cockpit mates to control the affairs of an airplane. In ‘Soul Plane’ with Snoop Dogg, matters got terribly funny as and when the airline decided to add more than enough passengers. Your guess is as right as mine. And with ‘The Two Pilots’ whether the plane took off safely or landed gently, only you the viewer and the various vulnerable passengers aboard the flight would know. Indications from the trails of the film, tells how arguably funny the movie will be. In order not to mince words here and there, the best thing was to approach the writer of the story himself. Speaking to the C.E.O of Royal Television who is also the executive producer of 'The Two Pilots’ about how the plot of the film came about, Mr Amankwah happily obliged. “About some seven years ago enroute to London from the Kotoka International Airport, aboard a British Airways flight, that was when the plan was hatched.” he said. “On the journey, I thought to myself, can anyone imagine this plane being piloted by some of our very own actors and actresses like Kwadwo Nkasa, Kalybos, Kwaku Manu, Akrobeto and the rest. “The imaginations was so interesting and funny to the extent that, I was laughing my head off. Since it was funny to me, I realised, so shall it be to so many other people in Ghana and across the world. “Upon my arrival in Ghana, I took a deeper concentration towards the development of the storyline, in order to get it right on point in line with the plot. “Shooting the film has not been easy given the various locations and other gadgets and equipment needed in boosting the quality of the production. As to how far he wants this film to go Mr Amankwah said: “We want this film to be one of the films that puts Ghana and her film industry on the world's map, in terms of acting. “ This is because, in most of our local films, all one would have seen in a film like this, is just the character wheeling their luggage inside an airport and the next seen would be a plane flying with no continuity, thereby cutting and pasting shots after shots. “But this film is quite different, in this film, what one sees is what one thinks in terms of continuity which is very close to reality. And that is not common among our films in Ghana. I think this is the very first time such a film is being shot in Ghana. 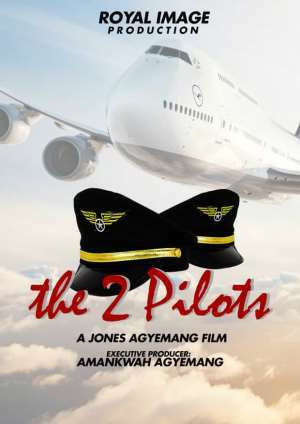 “So the rest, is for all Ghanaians both home and abroad to enjoy 'The Two Pilots' as it makes it way to Europe after its premiering in Ghana.